Founded 1899, a challenging parkland course. At 5,857 yards, not long but compensates by demanding a considerable degree of accuracy, providing a good test of golfing ability. High on the North Downs, up to 850 feet above sea level, one of the highest courses in the country, offering spectacular views. Most holes offer a flat or gently sloping prospect with only the 17th having a climb up to the green. The Clubhouse was substantially rebuilt in 1990 and has managed to retain its character, the result of which is a very comfortable building with facilities for members and visitors to enjoy. Above all, a Club with a 'friendly' reputation. A nice, enjoyable, but very quirky course. Worth a visit. Played in mid July, in middle of heatwave, practice facilities as far as I could see consisted of a couple of nets adjacent to the first tee, and a putting green behind th clubhouse.. not brilliant, but adequate for most. The fairways were all hard and dry and consequently, it was a bit of a lottery as to where the ball ended up, regardless of where you hit it, although, severely sloping fairways on many holes will play its part so ball placement is vital here. The greens however were in magnificent condition, surface wise, but they proved to be completely benign. I cannot remember a break of more that 6 inches on any hole from within 20 ft. The stroke index 1 hole is one of the quirkiest I have played...A large ditch extends down the entire left hand side of the fairway, with the first 200 yards or so, being OB., but this stops about 75-80 metres from the end of the same fairway. You are then required to cross over the ditch to another fairway, past the OB signs on your left, and at the end of which is the green...and it's a par 4. Two very careful swipes are required, but really big hitters may get on to the second part of the fairway with one swipe. In addition, it's not that often that you come across a huge tree in direct line with the green on a 165yard(thereabouts) par 3, so again a very good swipe is required. In fact we stood for several minutes unsure as to whether or not was the right green we were played in to. Tee mounds too were in perfect condition...flat and green. It's a relatively short course and the driver can be left in the bag for many holes, as ball positioning is the key to this course. One of the most enduring memories was the course layout...constantly, it seemed crossing other fairways, and on a couple of occasions having no idea as to which green to aim for, or where to go next.. having putted out..signage could be much better. It's a lovely course, but you either need to play wth a local, or play a time or two before becoming familiar with its' quirky layout.. strange also, that the practice green, is an extension of the 18th green..very wierd, when you are asked to stop practice whilst people are putting out. The people manning clubhouse and pro shop are very welcoming. And the food is not excellent...it's superb., but there again, I'm an Englishman, and I think fish and chips is a gastric delight. The front nine is fairly flat, but the back nine is rather hilly, so beware it will take its' toll on older members. Altogether a very, nice, if not quirky course, and worth a visit. It's the highest course in the county, and the club captain told me that bcause of this, in winter months it is frequently unplayable., so do check up ahead of your planned game is my advice. This course is tucked away in the Surrey Hills near Woldingham and is just 7-8 mins from the M25 (jct 6). The Clubhouse is traditional but has a very 'homely' feel and all the staff couldn't do enough to make us feel welcome. Good breakfast and drinks over-looking the 18th green were very pleasant. The course is parkland and is adorned with matured trees and some very pretty fauna and it was a delight to see so many greenkeepers out on the course (I counted at least four during our round!) Many of the fairways a sloping one way or the other so while fairly short in length, don't be fooled, you will face a real test. Signature hole has to be the Par 3 ninth and I clearly played it all wrong but my playing partnered got the Par. It is 160 yards and drops to a sloping green among the trees - a superb hole! However, no one hole is the same and if this course was closer to me, I would be playing it every month. The green had just been 'graded' but I suspect they will be VERY quick in the summer. They are a few hills to climb, so some may need a buggy but I don't think the 'fit & agile' among you will struggle at all. This will be a great venue for the 2018 TSG OPEN 2018! 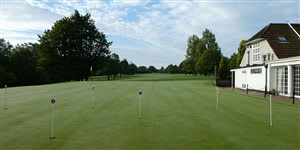 They also have some superb midweek deals including Monday Golf for less around £15 and I would happily pay double that!! North Downs GC is a short par 69 parkland course in Woldingham, Surrey. It is only 5,815 yards from the whites and 5,520 yards from the yellows. It is 800 to 850 feet above sea level. It originally opened in 1899. The course is in generally excellent condition, though fairways were a little lush in places. The rough is extremely penal. Provisional balls are required for any wayward looking tee shots. Greens were very varied, undulating and well guarded by bunkers or sheer banking to at least one side of the hole. The greens whilst in excellent looking condition were playing slow. Many of the greens had deep trouble for misses right or left. The front 9 is the less difficult 9; in terms of ease of walking and challenge. The back 9 is a much tougher, with difficult uphill elevation changes to navigate/endure. The par 3 16th hole is a tremendously difficult tee shot to hit the green. North Downs is a very welcoming club. They have an excellent ambience about the club with excellent bar, catering and dining facilities. Our erstwhile SES co-organiser Gary Archer was observed tucking into a large pre-match full English breakfast so all seemed well on the catering front. Weekday visitor green fees are £25 and £20 with a County Card. However they operate a £15 'golf only' green fee on Mondays, or £24 with coffee/bacon roll and a drink from the bar. Excellent VFM. For me this course falls into the category of being a difficult but enjoyable golfing challenge but the severity of the elevation changes make it one that I would not be rushing back to play again unless part of an organised group day. Very Good Day course was wet and some temp greens. North Downs is over 100 years old, not overly long, with interesting sloping fairways & cleverly designed dog legs. One needs to be fairly fit or a buggy will help as there are lots of climbs and descents. An excellent challenge for all levels where finding the fairways will be rewarding, so the driver might not be the best club for the long hitter. Greens were super fast, lovely contours, quite hard, difficult to read, bunkers as usual all very magnetic, some very deep, but with soft sand. Lovely scenery (North Downs) either side of the "B" road as the course has 2 parts equally challenging. Well kept fairways and first cut pretty good but then go a little further and you are in trouble. Water on one hole only, a small pond on a Par 4, the 14th. Today (16.6.2014) was a Charity Golf Day in support of a Sussex local charity "Respite", and a large amount of money was raised. It was very well organised, lots of lovely prizes for the golf and for the raffle. The best Carvery ever, be it the main meal or the wide selection of deserts: well presented and cooked, all very tasty and very welcome after a hard day on the course, a cold summer's day ! The day was well supported by Roger A. 's Pine Tree Society/ friendly TSGers from Essex, Kent, Surrey, Middlesex & Sussex of course. We had an unusual shot gun start: "an explosion" designed and magnificiently handled by Dr John W., not sure if the poor little squirrels and birds appreciated the huge "bang". Large & pleasant Ladies changing rooms. Pro shop was being refurbished, repainted but offered all the basics, and a very simplified course planner for £2. Must mention the practice putting green situated directly behind the 18th green, very unusual set up as one has to stop practicing when players approach their final hole. There is an outside seating area by the putting area and it does not feel safe, I rather watch the action from the Clubhouse, but there are big warning notices of the danger!!!!!!! But it does look attractive with all the roses and shrubs and flowers around. Unfortunately I wont be posting any photos as I did not have my camera. So maybe will return one day, as I like the course whick I played well on the holes that mattered for our Team, we won the 1st prize overall (thanks to Captain Paul T, his friend Shaun, Kevin G and I) Must have been my lucky day as I also won the 1st prize in the raffle..... So lots of goodies to take home.